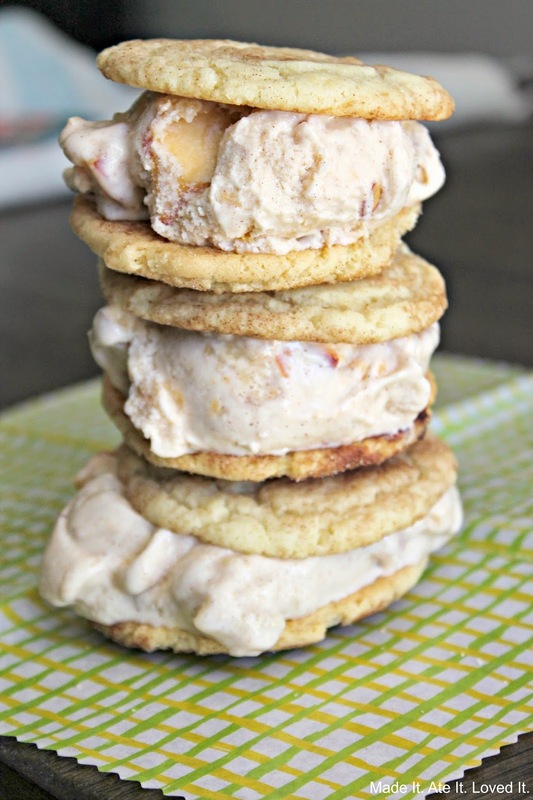 Peach Cobbler Ice Cream Sandwich - Made It. Ate It. Loved It. There is a local fruit stand here in Arizona and whenever they get Utah peaches and raspberries I always have to order a huge box! Last week we got our first box of peaches for the year. 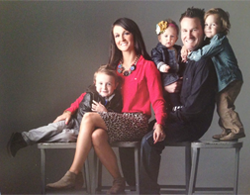 We have had a lot of fun eating and baking with them the past week. Last week I also received a fun box from Truvia filled with their packets, baking blend, and spoonable natural sweetener. I have been using them in just about everything! Oatmeal, smoothies, cookies, sugared almonds, peach cobbler, and some other fun recipes that I will be sharing with you next week! 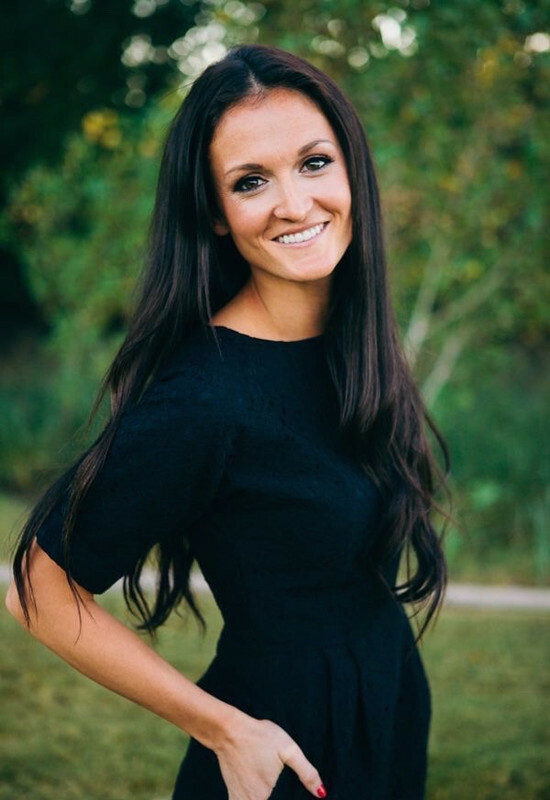 And with Labor Day just around the corner I decided to post this fun new recipe! We celebrate Labor Day in our family swimming and having a BBQ. 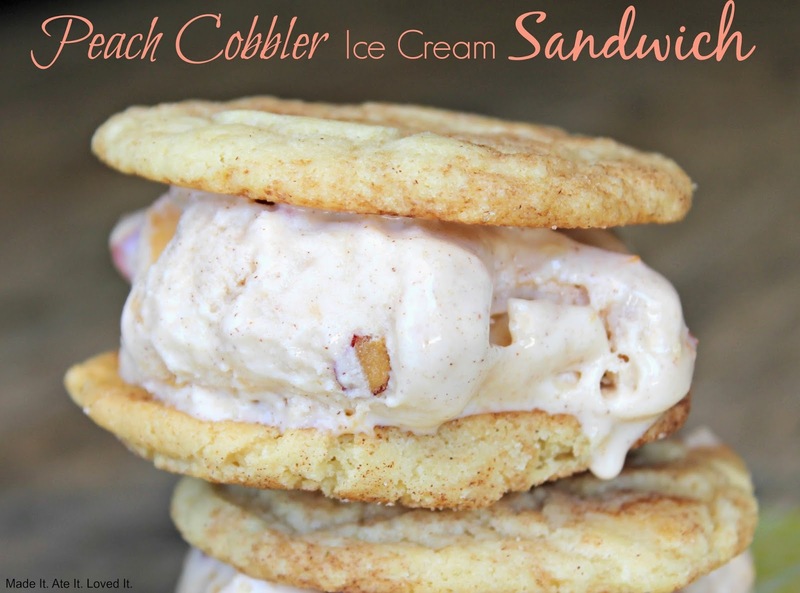 And what is better then peach cobbler, ice cream, and snickerdoodle cookies at a BBQ!? How about if you combined the 3? Well this recipe is just that! 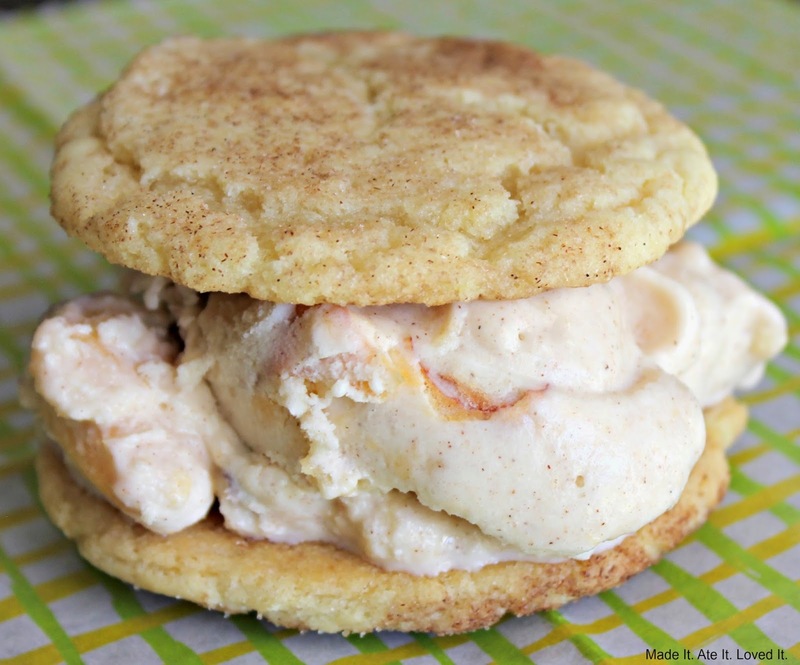 Peach cobbler ice cream in-between 2 snickerdoodle cookies to create a yummy ice cream sandwich! The combination is unreal! Like seriously! I could have just eaten the ice cream and been fully satisfied but then add the cookies and it makes it just a fun treat for the entire family! Preheat oven to 375 degrees F. Then in a bowl cream together shortening and Truvia. Then add vanilla and butter flavoring. Then add the eggs. Sift together dry ingredients and slowly add. Grab a small ice cream scooper or a spoon and form balls. In a small bowl combined the Truvia and cinnamon mixture. Then roll the balls of cookie dough in the mixture. Bake for 8-10 minutes. Place on a cooling rack. Let completely cool before making into ice cream sandwiches! In a medium bowl using a hand mixer mix together milk, Truvia, vanilla, cinnamon, and heavy cream. Then stir in diced up peaches. Then fold in crumbled up snickerdoodle cookies. Add the ice cream mixture to your ice cream maker and process according to manufacturer’s directions. Then put in a freezer safe container and freeze. When ice cream is thick and cookies are cooled off. Take two cookies and make ice cream sandwiches! You can also roll them in sprinkles or cinnamon sugar or whatever you like!